Middlesbrough manager Tony Pulis saluted his players’ efforts as they opened their pre-season friendly campaign with a 1-0 defeat to Sturm Graz in Austria last night. Former Sunderland midfielder Paddy McNair and ex-Bristol City centre-back Aden Flint both made their Boro debuts in the starting line-up. But they were unable to secure a win, with Champions League hopefuls Sturm edging the victory thanks to a goal from Markus Pink late in the first half. Boro have had a tough week’s work in training in Austria, with triple sessions and early rises, and Pulis gave every available player a run-out. 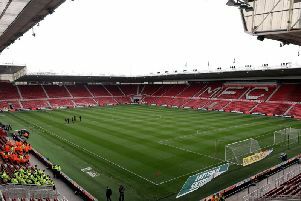 Only Ben Gibson, Britt Assombalonga and Harry Chapman sat it out with minor injury problems, while Daniel Ayala remained on Teesside because of a calf injury. “We were up early again this morning, working hard,” Pulis told mfc.co.uk. “And they’ve come in tand they’ve run their socks off and that’s all you can ask. “It’s against opposition who will be in Europe next season and who are three games in front of us. Pulis was happy with the whole team’s efforts, adding: “I’m not going to pick anyone out. “They’ve been brilliant, and their attitude has been fantastic. McNair, snapped up from Sunderland, had Boro’s best first-half opportunity, but the Northern Ireland cap fired high and wide after good work from Bamford. Lukas Grozurek hit a shot over Darren Randolph’s bar before Sturm forged ahead on 42 minutes as Pink headed home a right-wing cross. A host of substitutions in the second period saw former Sunderland loan flop Ashley Fletcher get a welcome chance to shine as Pulis gave all nine of his subs time on the pitch. He put himself about and had a goal disallowed for offside, leaving Boro to succumb to a narrow opening defeay.